The week-long International Conference on Biodiversity and Climate Change (IConBACC ) 2018 was successfully carried out on August 8-10, 2018 at the Misamis University Auditorium. Misamis University hosted the successful event in collaboration with the University of Sri Jayewadenepura, Nugegoda of Sri Lanka and the Vellore Institute of Technology of India. The event effectively brought together researchers from around the world, all equipped with their respective studies on botany, biodiversity, and ecosystems, climate change and it’s impacts, urban sustainability, environmental policies and resiliency to climate change among others. The conference welcomed keynote speakers from around the world who shared their expertise in their respective fields. Dr. Wathuge Thamara Priyanthi Sandun Kumari Senarath of the University of Sri Jayewadenepura Gangodawila of Sri Lanka discussed botany in the climate change context, and Dr. Glenn Fernandez of the Institute for Disaster Management and Reconstruction of the Sichuan University of Hong Kong spoke about disaster management and reconstruction. The event also invited Dr. Darren K. Griffin of the University of Kent from Canterbury, England who discussed about biodiversity in the animal species and how it had helped the animal kingdom survived eras of climate change. Dr. Cristina C Salibay and Dr. Esteban T. Salibay Jr. of the De La Salle University - Dasmariñas, Philippines shared about microorganisms in the context of biodiversity. 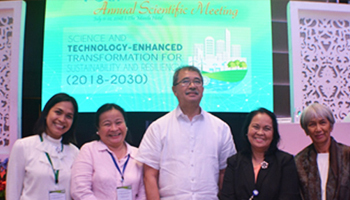 Dr. Olga M. Nuñeza of the Mindanao State University-Iligan Institute of Technology, Philippines pointed out the effect of biodiversity and climate change on crop yields and food security specifically in the Philippine context. IConBACC hopes to create an annual platform for experts, government officials, professionals, students, and other stakeholders to share their research, practices, and innovations in today’s global challenges with biodiversity and climate change. The conference also aims to inspire individuals to face biodiversity challenges and build resiliency for global sustainability.